We’re on the tarmac in Chicago and the flight attendant is walking down the aisle while the safety video is on and she sees this passenger on his cell phone talking and she’s like, Sir, you need to turn your cell phone off! And he’s like, hold on a minute, to whoever he’s talking to on the phone, and then he covers the mouthpiece with his hand and asks the flight attendant, what flight number is this? The flight attendant is all, Sir, you can’t be on your phone right now! The safety video is on. You need to turn it off. She’s all pointing at the safety video and it’s at that part where the guy in the suit reaches up and grabs the oxygen mask and places it over his nose and mouth, looking way too relaxed for a guy who has just placed an oxygen mask over his nose and mouth because he’s probably going through a decompression or something and should probably be hyperventilating with the rest of us. The man on the phone tells his friend to hold on again and says, I JUST NEED TO KNOW THE FLIGHT NUMBER, MA’AM! My colleague tells him she doesn’t know the flight number, which is kind of weird because I swear I saw her looking at our flight itinerary like five seconds ago when I asked her if she knew the flight number. TURN IT OFF she demands, making her eyes all squinty, which makes her look a little crazy and has zero affect on the man because he’s just looking at her as if it’s no big deal there’s a flight attendant screaming at him and looking all crazy. He tells his friend that the flight attendant is not being very helpful. That she’s putting a lot of stress on him. This only makes her put even more stress on him because she says TURN THE DAMN PHONE OFF NOW! RIGHT NOW! which not only makes him jump, but also works because he actually turns it off and puts it away. I had one person ask me after we were at 32000 ft if he could start using his phone again. lol I responded nicely but he wasn’t very happy. Later we found him trying to use it 🙂 How did we ever make it before cell phones? This is one of my biggest pet peeves and I’m not even a flight attendant. For cryin’ out loud, people, put the crackberries and the cell phones away when you board a plane! You need a ZAP PASSANGER button ! Funny that cellphone usage will all of a sudden become “OK” once the airlines figure out a way to nickel and dime customers for using them…as per the tests undertaken by Boeing and Airbus, and select international carriers. I hate going through this cell phone stuff with passengers all the time. How hard is it to turn it off when you get on a plane? Is there anything so important that you can’t say it all before you board? Personally I could care less if you talk on your phone, but the FCC and FAA say you have to turn it off before we can push back, and I don’t want to deal with a fine, so turn the damn thing off. Hi! I really hate these kind of passengers. As a future passenger I think I’ll freak out when I see my seat mate using the cell phone. Hello!? Why they don’t understand the phone’s microwaves affect the sensors and the communications? 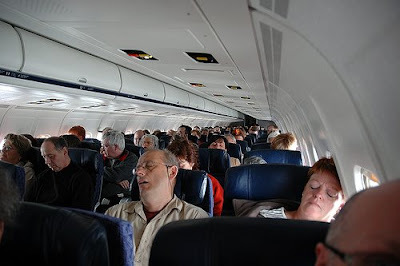 These passengers should be fined and deplaned immediately. Watch out because I’m going to become a flight attendant and as a passenger I am very-very ruly. And tidy. 🙂 Skydoll, I wish you only good passengers, to you and to your colleagues. Thank you!